Kann ich jetzt ins Kino und den Film sehen? Nein? Wieso nicht?! Die einzelnen Clips könnten etwas länger sein – aber es gibt ja bald neues Material. Bis dahin: viel Spaß! We are proud to present this video which showcases some of ILM’s Oscar nominated effects work for the 2012 hit film, „Marvel’s The Avengers“. This reel represents a small fraction of the work created by over 200 ILM artists, scientists, and engineers backed up by a world class production team. The stop motion animations which open and close the reel were done the old fashioned way – by hand, one frame at a time. They were crafted by ILM’s stop motion guru, Erik Dillinger specifically for this reel. College Humor haben bei mir mit ihrem „How It Should Have Ended“ ja auf ewig einen Stein im Brett – aber mit dem Clip dürfte das ein halbes Gebirge sein. Was wäre, wenn Batman auf die Avengers trifft? 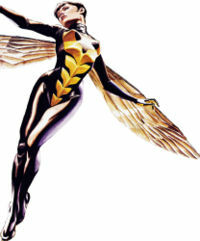 Phase 2: The Wasp in Iron Man 3?